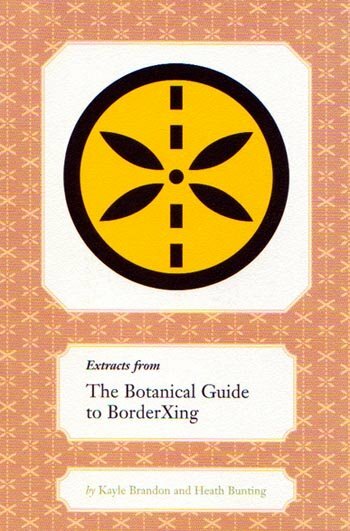 Extracts from The Botanical Guide to BorderXing (2004), a pocket-sized pamphlet created by artists Kayle Brandon and Heath Bunting, cleverly lures both wild plant enthusiasts and border crossers into the often treacherous terrain of nature asylum. Brandon and Bunting state in the pamphlet's brief introduction, "The guide can be used to identify plants, terrain, and strategies across a broad range of crossing conditions. People border cross whether they are fleeing persecution or seeking change." 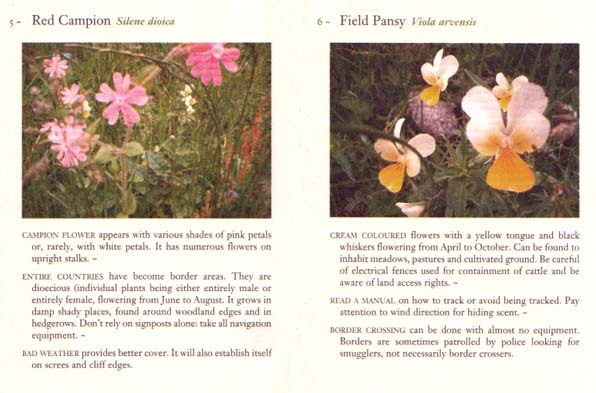 The specifics of the European flowers and plants illustrated in the guide enables border crossers to be aware of the toxicity of popular specimens in the event of ingestion during times of survival. The dichotomy of floral beauty and potential illegal activity starkly highlights the absurdity of political and economic edges in a world where weather, wind, water, and sun should dictate the rules of the day.